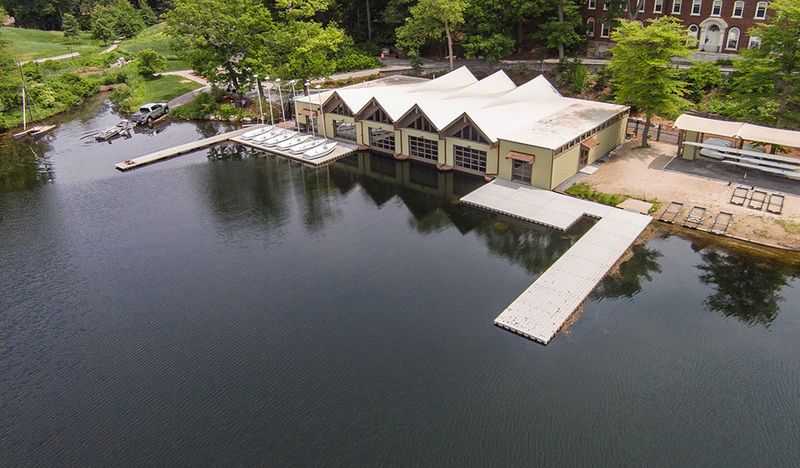 Over the past year, the boathouse on Lake Waban has undergone a comprehensive renovation thanks to the generosity of Alice Lehmann Butler '53 and her husband, John. A dedication ceremony will be held tomorrow, Friday, September 25, during Family and Friends and Homecoming weekend. The Butlers' gift enabled much-needed updates to the structure, which dates back to the early 1960’s, increasing campus-wide recreational opportunities and also supporting other Physical Education, Recreation, and Athletics (PERA) initiatives. The Butler Boathouse, as it is now known, was completely renovated, and made more accessible. The renovation created a new main entry, prep room, improved shop space, a canoe/kayak room, and storage. The project also improved the north end of the site, addressing soil erosion and drainage issues. Alice Butler, who followed in the footsteps of her mother, Elinor S. Lehmann, Class of 1913, in attending Wellesley, was drawn to the College by the beautiful campus, the serenity of Lake Waban, and by an interest in science. As a student, Alice participated in field hockey, synchronized swimming and dorm crew. Alice and John have long advocated for an active lifestyle and, believing strongly that physical fitness is key to a successful life, "Their hope is that by participating in physical activities, including but not limited to water sports, students will seek pleasurable ways to stay fit and healthy throughout their lives," according to a plaque now hanging in the boathouse. Wellesley was the first college in the United States to have a varsity women's crew program, but the boathouse is not limited to varsity participation; it is a wonderful resource for the whole community. Dorm and Class Crew is a long standing tradition at Wellesley College and recreational boating is open to all Wellesley College students, faculty, staff, and alumnae with a Wellesley ID. The formal dedication of the Butler Boathouse will take place tomorrow, Friday, September 25 at 3:30 PM. Alice and John Butler will speak, as will President H. Kim Bottomly, Bridget Belgiovine, director of Athletics, chair of Physical Education, Recreation, and Athletics (PERA), and Emma Howey '16, who assists with PE classes and other boathouse activities as a boathouse engineer. A reception will follow. Mildred Hayward Chase '36, who celebrated her 101st birthday in July at the Wellesley College Club, will also be in attendance. Chase heard about the dedication through a class of '53 alum and wanted to attend because, "rowing at Wellesley was such an important part of her life." Chase will be joined by her daughter Barbara Chase '68. She is also the mother of Katherine O'Dell '63.